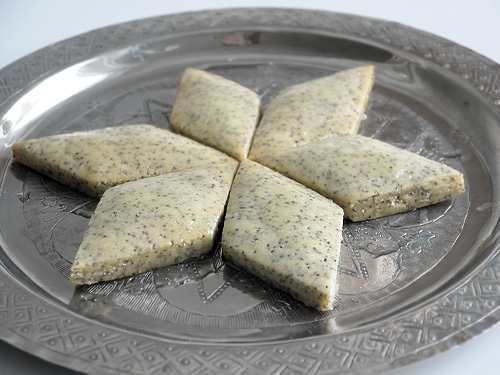 Earlier this year I baked some Hamantaschen with poppy seeds in them, but I can’t wait to bake these too. Hi KM – good question about the shapes, and the honest answer is – no idea! But when making the cookies, the dough works better if rolled out and cut (when you make balls and try to flatten them, they cracked round the edges), so I think it might actually be tradition for this sort of dough. And I found your Hamantaschen pics – love the lemon/poppy combination! Those sound delicious, and they’re pretty too! These look amazing – I’m just about to make them. One question: how do they store? As in, can you put them in a jar, or do they stick together? They do stay sticky, so I would recommend storing in a sealed jar with layers of greaseproof paper (the stuff that feels waxy) to stop them sticking. Remember too that the texture is like shortbread with a sticky coating, it does not all get mopped up by the cookies. Good luck!